The last-minute UFC on ESPN+ 1 betting odds are in. Tonight (Jan. 19), UFC on ESPN+ 1 will be held inside the Barclays Center in Brooklyn, NY. 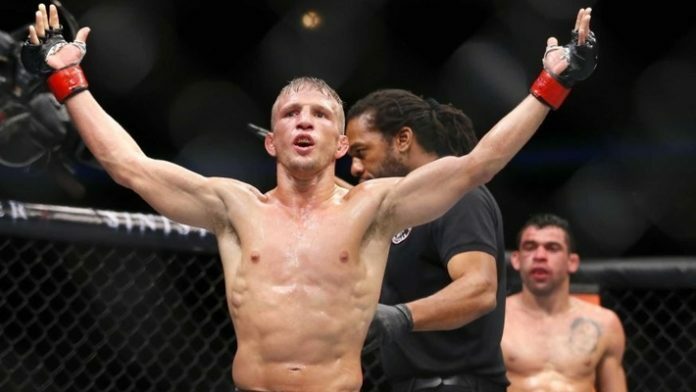 In the main event, Henry Cejudo will defend his UFC flyweight title against bantamweight ruler T.J. Dillashaw. Both men made championship weight, making this title bout official. Check out the rest of the weigh-in results here. The co-main event will feature a heavyweight battle. Former NFL star Greg Hardy is set to clash with Allen Crowder. This will be Hardy’s UFC debut. Also on the card will be Gregor Gillespie vs. Yancy Medeiros, Joseph Benavidez vs. Dustin Ortiz, Paige VanZant vs. Racahel Ostovich, and Glover Teixeira vs. Karl Roberson. There will also be a slew of preliminary action, which ends with Donald Cerrone vs. Alex Hernandez on the major ESPN network. The prelims will begin at 6 p.m. ET, while the main card starts at 10 p.m. ET. Stick with MMA News for live coverage of UFC on ESPN+ 1. We’ll be bringing you live results, highlights, and post-fight tidbits.